* Virgil, Aeneis 8.364-5. We quote it in the English translation by Theodore C. Williams. John Colbatch was born in 1664. He studied at Westminster School in London between 1680 and 1683, and then he was admitted to Trinity College in Cambridge. He became fellow of the College; in 1690 he graduated M.A., and in 1706 Doctor of Divinities. At the beginning of hist pastoral carreer he spent seven years in Lisbon as chaplain of the British factory. From 1701 for two years he was tutor of the son of Duke of Sommerset, Chancellor of the University of Cambridge, and for two more years he accompanied him to travels; then he was dismissed. At the age of forty he returned disillusioned to his university, where he became professor of casuistic theology. His lectures of moral philosophy were renowned. In the feud between the fellows and the master of Trinity College first he wrote a pamphlet in defence of the master, Richard Bentley, but in 1714 he refused the master's invitation to become his assistant, so they came into conflict with each other. Colbatch enjoyed a canon's stall of Salisbury between 1702 and 1720. Besides university lectures he also accepted the pastor's office in the nearby Orwell of Cambridgeshire, and he kept it until his death. He died on February 11, 1748. The British standard biography [DNBC] laconically characterizes him as "opponent of Bentley". Richard Bentley (1662-1742) was an eminent philosopher and critic, editor of a series of classical authors. He was in correspondence with Newton about the new discoveries of this latter and the impact of these on religious faith. Between 1700 and 1742 he was master of Trinity College, and for a while archdeacon of Ely. He tyrannically reduced the rights of the college fellows, who turned to the Bishop of Ely. The protracted litigation ruined for years the life of the college and of the university. In 1714 even Newton was invited to appear in it as an expert, as he had renounced his position because of his removal to London. – Works of John Colbatch: Account of the state of religion and literature in Portugal. – An account of the court of Portugal under the reign of the present king Dom Pedro II : with some discourses on the interests of Portugal. London, 1700. 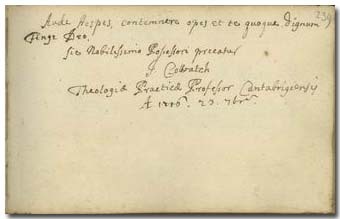 Colbatch signed his dedication written in the album in 1716 as professor of practical theology. A day later also John Covell (p. 476), master of Christ’s Church College wrote in the album, but Richard Bentley is missing. Apparently a principal question of the academic life in Cambridge and perhaps also elsewhere was to take a position either against or on the side of Bentley. András Ajtai Szabó (p. 451) wrote on March 6, 1716 to Covell from London that here he met Bentley and told him about the case of the College of Nagyenyed (Aiud). So when Ferenc Pápai Páriz travelled to Cambridge in September of the same year, he had to choose whether to contact Bentley or his opponent, Colbatch [Gömöri: Adalékok]. – Our theologian Colbatch is not to be confounded with the physician Sir John Colbatch (?-1729), author of a number of works on medicine.